all of her fabulous party planning secrets with us. To help anyone "Throw a FiNtastic party" by "Turning Your Party Into a Memory"
I was unexpectedly inspired in ways I didn't see coming. I also uncovered inspirational gems buried within the text itself. they beautifully spillover into applying them to everyday life. "...being fully present is the best present you can give your guests [family]." "It's really all about living in the moment and making people feel special." "...it's the small things that make life big." "Keep your energy aligned with all the greatness that is headed your way." whatever we are working towards at that time". the book is filled to the hilt with valuable information related to every aspect of the party planning process. You'll also find recipes, ways to keeping your budget trim, party game ideas and so much more. Giveaway closes at 12:01a.m. Friday. Winner announced Friday, June 29th. I was excited and honored to have been asked to review Mermaids & Martinis. and THANK YOU in advance for participating! as well as for the opportunity to share a copy of Mermaids & Martinis with my readers!! 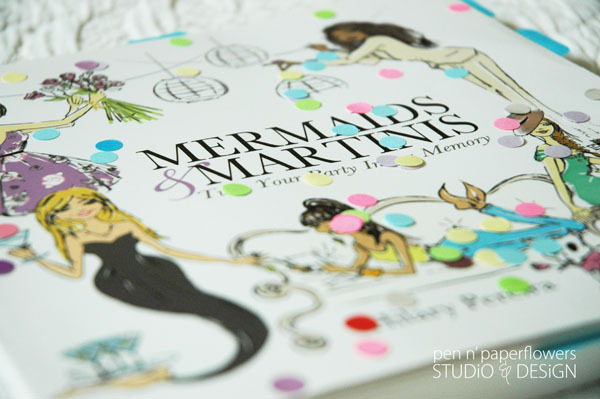 GO HERE TO ORDER YOUR COPY OF MERMAIDS & MARTINIS! You may see more FREE art prints created using some of the text from Hilary's book...LOVE the inspiration. Ever heard of "Hostess Slippers"? I hadn't until I read the book. and I'm SO stealing the "Rose Water" recipe idea in this book. Can't wait to try it! I am currently planning a Vintage Fall Wedding. Would love to win the book to read more about how others approach the party planning process. I'm planning an outdoor bbq/bacon party in a few weeks! This is my favorite type of book to read!! I love to entertain and will throw a party at the drop of a hat. I tried reading around the confetti dots in your photos and love what I could read so far: such down-to-earth tips and tricks!! Thanks for the chance to win this one!! I am planning a few summer fun parties and can never have enough help with planning. This book looks fabulous! Next party Im planning is going to be my daughters birthday party! Not sure of the theme yet! This book looks amazing, thanks for sharing and for the chance to win! I am planning a summer birthday party for my friend. This book is beautiful and insightful! I would love to use the inspiration to plan my sister's bridal shower. My daughter is currently planning a bridal shower...the 6th bridal and/or baby shower in 3 years. This book would be perfect...since she's running low on ideas. Most of the showers are attending by the same circle of friends...so a book of fresh ideas would help. I am planning a meet & greet for incoming college freshmen & their parents. No one will know each other before the party. I can figure out basic decorations & food, but it would be great to have some new ideas. I'm planning a murder mystery dinner and I love to entertain. This looks like it has great ideas, and would be a great resource. Rose water on the hand towels, love it! Hilary was a childhood friend of mine and I knew she would become someone spectacular someday! This book is so well done and is full of creative and unique ideas. I am always looking for ideas to celebrate my twin daughters' birthday parties. We are thinking butterfly garden theme this year. I'm planning a baby shower and my own birthday party. I host numerous events, and I cannot get enough new ideas for entertaining! I am planning my sons 4th birthday party. The next party I am throwing is my best friends 30th birthday party in July! Looks like there is a lot of great inspiration here. I am always in the midst of planning something fun, even if it's just for our family at home. I dream of throwing parties for my friends, my kids' birthdays, and for the holidays! The next party I am planning is my daughter's 7th birthday/pool party. I almost always have something in the works and this book will help keep the creative juices flowing! Thanks. Thank you to everyone who participated in this giveaway! The winner has officially been selected and emailed. Check out the announcement on the blog to see if it was you! !